Photo Credit Deb Louden, Mioty sits on her bed and plays. When Mioty first arrived, she had a permanent scowl. Her left eye was missing and her face was distorted. She played, but very aggressively, as if she’d spent her whole life fighting. Mioty was one week old when her mother went to work and left her with her older siblings. While she was away, Mioty was attacked by a wild animal. 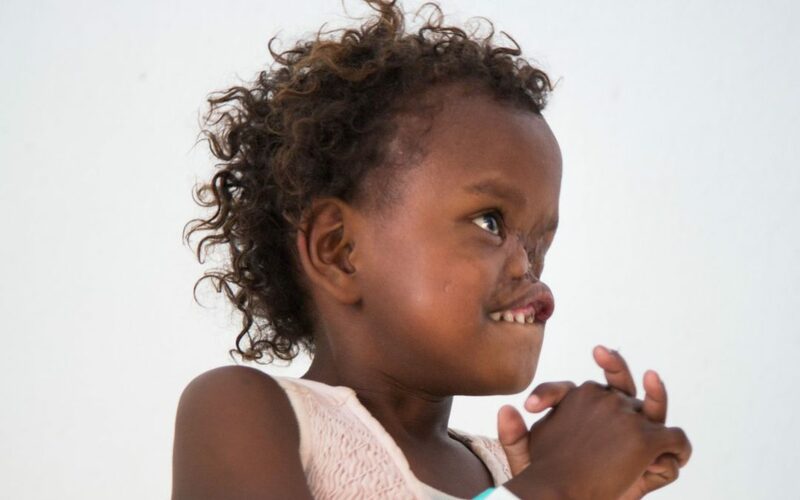 It left a hole in her face that got infected, most likely with a flesh destroying bacteria called Noma, which ate away her nose and ruined her eye. A local doctor stitched her eye shut and told her mother to pour hot water on her eye every day. Mioty’s mother didn’t know what else to do. Mioty was terrified. She screamed with every treatment, even though painless, for over 5 weeks. Moity’s mother had kept her indoors for 5 years to protect her from nasty looks and comments. Her eyes were tired and defeated yet all she wanted was to protect her baby girl. We tried our best to make her smile, but our attempts were futile. Her whole head was bandaged and she could barely see out of her one good eye. Moity was unresponsive. Our hearts were hurting for this precious child. Were we disheartened by this little girl? We prayed frequently for Moity that she would come to trust us, that through our love, the little girl inside would re-emerge. Photo Credit Catrice Wulf – Mioty plays on Deck 7. 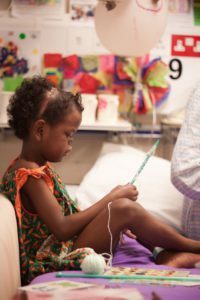 After treatments Moity would throw herself under her bed, sometimes for hours. She would swing her fists and refuse all medicine. We tried to camouflage her medicine but she couldn’t be tricked. The only way was an injection. As we watched Mioty sleep we prayed that the peace we saw would become the peace she would have when she was awake… that whatever was tormenting her would be gone. Then something about Mioty changed. Was that a smile we saw? We even caught her singing. 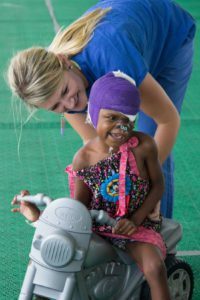 We couldn’t hold back the tears as we watched her ride around the ward on her little scooter, smiling and laughing. We saw Moity’s heart heal a little. A heart that spent its whole life fighting and not allowing anyone in, because no one had ever tried to enter. Mioty was becoming a little girl again, slowly letting us love her. The torment of the past five years was lifting. It was so worth it to love Mioty!